The primary conviction when considering distal hind limb angle and toe length is the horse's necessity for an appropriate amount of pelvic limb LEVERAGE. Some degree of leverage is required to engage the horse's hind limb stay-apparatus (also known as the reciprocal apparatus). The stay-apparatus is a compilation of tendons and ligaments which function like a pulley-lever system and help to support the weight of the caudal (back) half of the horse's body. Although the stay-apparatus is generally associated with 'resting' of the hind limb(s) while in the standing position (such as when the horse is sleeping), it is also an integral part of normal pelvic limb movement and function during exercise. Effort of the intrinsic pelvic limb muscles is reduced during engagement of the stay-apparatus, which allows the horse to move efficiently and with normal stride length and metricity (height of stride). Since tendons and ligaments do not 'tire' with exercise, their engagement enhances pelvic limb stamina as well as movement.The APPROPRIATE amount of pelvic limb leverage, therefore, is that which engages the stay-apparatus in normal fashion. This becomes especially important at the canter, during which the stay-apparatus is intimately-involved.The appropriate amount of pelvic limb leverage may be different among a population of individuals, meaning that some horses are able to handle more pelvic limb leverage than others. In any case, it is important that we as veterinarians, farriers, trainers and riders maintain each horse within their GREEN ZONE, which (for the purpose of this article) denotes the individual's acceptable range of pelvic limb leverage. Too much or too little leverage behind (i.e. outside the margins of the GREEN ZONE) will dramatically affect the function of the stay-apparatus and consequently the horse's potential for performance. 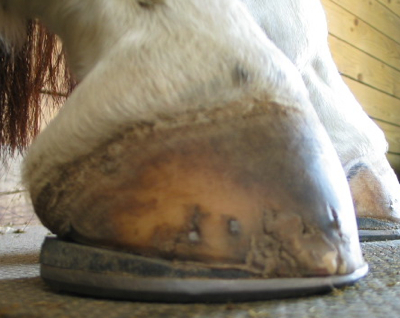 Each horse's GREEN ZONE is influenced by many factors which include age, breed, size, discipline, conformation, distal limb and/ or P3 angle, toe length and foot breakover. We can reduce the amount of leverage to facilitate or ease pelvic limb breakover. This is often done for horses with musculoskeletal problems (such as arthritis, tendonitis, desmitis, or upward patellar fixation) in an attempt to alleviate symptoms and improve comfort/ performance. It should be understood, however, that we can reduce the amount of pelvic limb leverage to the point of disabling the stay-apparatus. Without ample leverage, the pelvic foot is unable to attain purchase of the ground surface/ footing. In this case, the foot breaks over before the stay-apparatus can be effectively engaged. Consequently, a short-strided "up-and-down" pelvic limb gait is adopted.This type of gait not only requires increased pelvic muscular effort, but deleteriously affects the appearance of the stride. A person walking on stilts acquires these gait characteristics due to the dramatic reduction in foot-length relative to limb-length. Too much leverage may cause premature or prolonged engagement of the distal patellar apparatus associated with the stifle region. The upper limit of the GREEN ZONE, therefore, is governed by the horse's predisposition to stifle interference. Increased age, a down hill topline and/or abnormally-straight pelvic limb conformation all increase a horse's susceptibility to stifle interference (i.e. proximal patellar hesitation or upward patellar fixation) and therefore affect their acceptable range of pelvic limb leverage (i.e. the limits of their GREEN ZONE). A horse with these characteristics, for example, might have a 'smaller' GREEN ZONE than a younger horse with an uphill topline and normal pelvic limb conformation. 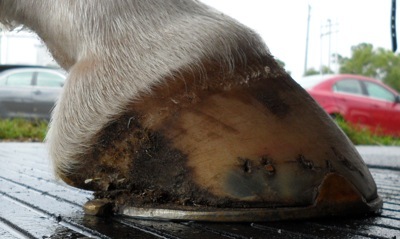 Horses with stifle interference tend to exhibit a marked delay in the cranial (forward) phase of the pelvic limb stride and a hypometric (toe-dragging) gait, much like a person wearing flippers at the beach. The veterinarian should use all available elements to determine each individual's GREEN ZONE, and formulate a plan that provides enough pelvic limb leverage to effectively engage the reciprocal apparatus without resulting in stifle interference. The horse will tend to perform at his/her best within these margins."